Look I am going to be blunt about this series. I think the Teletubbies are a waste of time that basically do nothing to educate children or even teach them the correct way to pronounce words. Why then, does my child love them so much? I got to answer those questions and even change my opinion ever so slightly whilst watching this disc with her. First things first, these little guys are beautifully coloured and even attractive to look at for little kids. The landscape around where they live is bright and filled with light and sound. The sun on their world has the face of a young boy that laughs and carries on as he will. I think that the main source of entertainment for kids with these creatures is purely an amusement factor. They do things that very little people will find funny, especially the scene where they all step in a puddle even though being warned time and again to avoid it. My daughter was in hysterics every time a Teletubbie stood in the muddy water, squealing with laughter. Other antics also take place around their home and other places that will amuse and delight very little kids. There is very little on this disc for the adult viewer and nor should there be. The main bonus is that you are getting two shows on one DVD that is good value. I found that kids get very involved in this series and Ella quite readily joined in the action on the screen especially during the dancing which was actually quite contagious with some very nice music. As far as a DVD goes, there are no faults with the disc and the audio is well presented in Dolby 2.0. There are no extras on this disc. In conclusion, this DVD is one that Ella gets to watch as a "treat" as frankly I am apprehensive about her learning bad habits with her speech. She is an articulate little girl and I think that they set a pretty bad example as far as that is concerned. 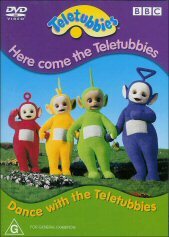 However when it comes down to sheer entertainment for youngsters, the Teletubbies win hands down!